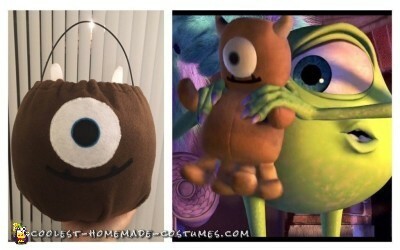 Take a look at the supplies and instructions I used to make our Monsters Inc family costumes. The pattern was made using my husband’s regular clothing. I had to use the special “walking foot” presser foot on my sewing machine due to the thickness of fabric. The horns were red devil horns that I painted with acrylic paint. Then, the spikes were free handed. Also, the gloves were free handed with the claws being small pieces of black felt. In addition, I would have used the gray fabric if I had more time. Many seams were taken out and redone due to sizing issues. The costume is very heavy and my husband overheated a lot while wearing it. Most of the time he had the hood down and zipper halfway open. 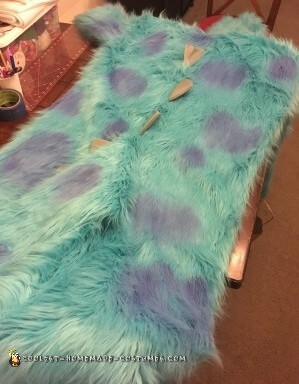 The spots were painted on with watered down acrylic paint – I found a few YouTube videos of how to paint faux fur and did a practice test on a scrap piece of fur. The fur makes a huge mess when cut and be aware of the direction of the fur. I had to redo an arm because I cut out the fabric piece upside down. So, the pattern was made from a free beanbag pattern I found online. The face design came from an image I found on Google. I made an inside “pocket” with white fabric, so I could “stuff” the costume with newspaper, but I never got around to it. 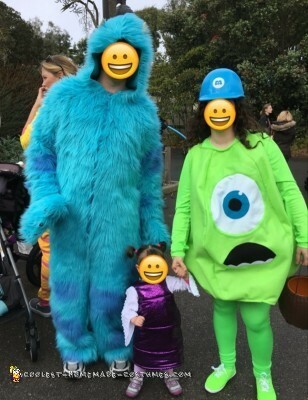 I’m partially glad I didn’t stuff the costume as I was able to move around more freely and it was easier to carry my daughter. Also, the hard hat was an old one from work that I sprayed blue. Then, the logo was found on Google and was printed on a printable shipping label. So, the pattern was a rectangle based on my daughter’s size. I used quilt batting between the purple scale fabric and black fleece interior. Then, the sleeves were free handed based on my daughter’s size. The hood was snapped on since the back of the costume had a zipper (think Snuggie with a zipper closure). In order to give it shape, the hood has a colander inside of it. 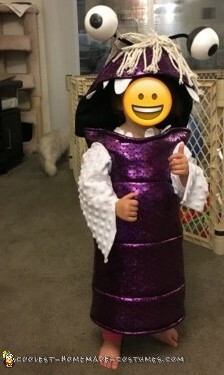 Also, pipe cleaners were threaded through the purple scale fabric, colander, and black fleece to hold everything together. I sewed a few strands of the mop together and then hand stitched them to the purple scale fabric and colander. Then, the eyes were free handed with black sharpie and glued onto the end of the pipe cleaners. I was going to paint them, but the sharpie worked really well. 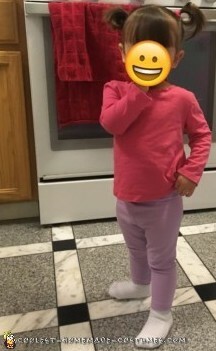 It did smear a bit, but my daughter rarely wore the hood, so it wasn’t a big deal. The pattern was based on the pumpkin size. 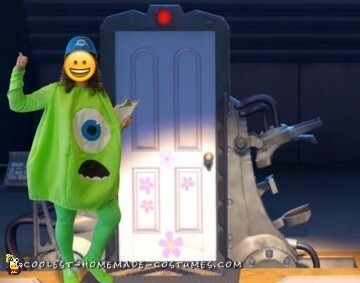 The costumes were loved by all, but we didn’t win any contests. 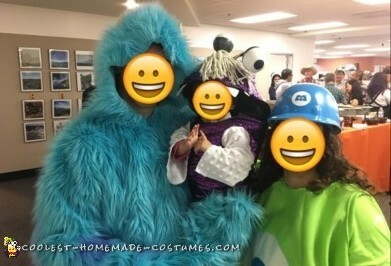 People were always amazed when I told them I made our Monsters Inc family costumes. The costumes took a lot of time to make, but I’m very happy with how they turned out. 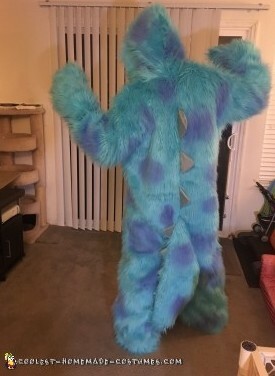 Mike was the easiest, Boo was a tad more challenging due to all the components, and Sully was a big task due to the fur getting EVERYWHERE and the bulk of the costume in the sewing machine. 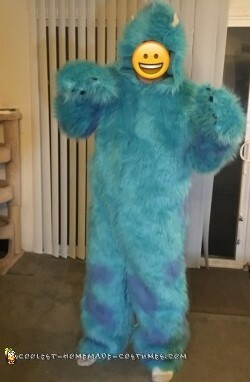 So, I had some of the fabric and paint on hand already, therefore my grand total of $200 for all 3 costumes is a tad low.